This webinar will showcase current ongoing research focused on using unmanned aerial vehicles (UAVs) for conducting site inspections applications. The study, being conducted by Auburn University researchers, focuses on erosion and sediment control applications in construction. Participants will be exposed to UAV technologies to develop: project progression documentation, photogrammetric site visualization, highly detailed digital elevation models, and assessment of vegetation and crop health. Developed inspection methods, case study site assessments, and preliminary research findings and results will be discussed. The webinar will cover topics geared towards conducting inspections for construction, infrastructure, environmental, and agricultural applications. This webinar will present information on the hydrologic and sediment transport effects of wildfires. The presenters will draw on experiences with post fire hydrology from wildfires including the Cerro Grande Wildfire that caused heightened flood risk for a nuclear facility at Los Alamos National Laboratory in New Mexico and the Missionary Ridge, Fourmile, Black Forest, and Waldo Canyon Wildfires in Colorado. The webinar will present the science behind hydrologic changes from wildfire and will provide examples of tools and methods that can be used to quantify changes to peak discharges, runoff volume, and sediment yield in a risk-based context. The All About Vegetation Establishment package offers you a 40% discount of critical vegetation establishment training. This package includes access to: - The Important Role of Vegetation in Stormwater Management - Vegetation Basics - Plant Selection for Erosion and Sediment Control - Sustainable Native Plant Establishment Bioenginering and Sucessful Monitoring Methods - Part One & Two - How to Write and Design Revegetation and Erosion Control Specifications - Biotic Soil Amendments for Soil Revegetation - Improving Infiltration and Vegetation in Post-Construction Soils Continuing education credit for this package is 0.8 CEU (8 PDH) Credit. The package offers you more than a 40% discount off courses addressing sea level rise, working in waterways, ecological monitoring, fluvial geomorpholy, beach and shoreline restoration and TMDL Compliance training. Continuing education credit for this package is 0.8 CEU (8 PDH) Credit. Revegetation, reclamation, and mitigation become increasingly difficult as water becomes the most limiting factor for plant growth. These problems often are compounded in semiarid and arid regions by salinity, which further restricts plant growth, and sodicity, which destroys soil structure. The inability to establish surface vegetative cover exacerbates problems with both wind and water erosion. This presentation will address which soil and climate properties to evaluate to predict the success of revegetation efforts, and identify methods to address the specific management challenges encountered in working with arid and semiarid region soils. This online course condenses nearly 20 years of authors’ experience into1 hour. The course includes fascinating facts about the history of bioengineering in the West. Where did the term “Straw Wattle” originate? Answers to the question about “design life” of biotechnical methods lie in understanding successional reclamation? Plus, this course will offer 4 of the most useful willow methods. For novices to experts, this course is a must for those interested in Bioengineering (AKA • Biotechnical Soil Stabilization). Understand the guiding principles behind the Biotechnical techniques, the geotechnical benefits, the history, and the many important details necessary for a successful project. Designers and implementers will improve your success. The techniques covered are applicable to both river and upland settings. Learn from past projects, proffered with the benefit of time and presented in straightforward manner. This webinar will highlight treatment technologies that can be implemented in the construction industry to manage turbidity from dewatering operations. Dewatering methods are briefly introduced; however, the course focuses on best available technologies to treat and polish pumped effluent. Participants will be exposed to a decision matrix that assists in identifying the appropriate treatment for a site specific operation. Upon selection of the treatment, basic design elements are presented for consideration. The webinar targets a broad based audience who can use the information provided as a foundation to then independently research a specific treatment technology in more detail. Often construction-phase and post-construction stormwater management are separate worlds (different permits, different plans, different practices, etc. ); however, in terms of hydrology, water quality and the ultimate success or failure of post-construction practices, they are closely related. This webinar will briefly review stormwater regulations for construction and post-construction and will explain how hydrology is a unifying theme. 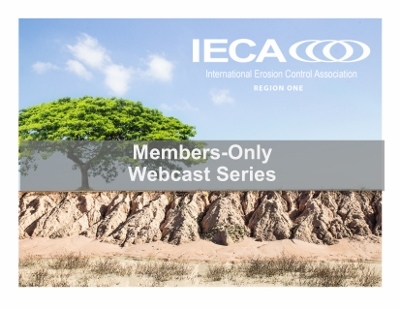 The webinar will include state-of-the-practice details for common LID and GI practices and will focus on details that are important to pay attention to during construction for successful stormwater quality management for the long term. While the US EPA has withdrawn its proposed turbidity limit on construction site runoff, there are still many states have or are proposing their own enforcement levels. Construction site owners and managers are also looking for ways to avoid public outcry and potential lawsuits over muddy water leaving their site. In most cases, typical and even more advanced erosion and sediment control practices will not prevent discharges that look like chocolate milk. This two-part seminar will explore the principles behind chemical treatments to rapidly settle suspended solids and reduce turbidity in runoff from construction sites. In the second part, he will then go over a variety of methods to apply those principles to greatly reduce turbidity. After conducting research on this subject for over 10 years in both laboratory and active construction site setting, McLaughlin has a lot of data to back up his recommendations! He will wrap up with a discussion of suggested chain of command options to avoid failures.